I´m the last one in my company but i draw the line here, see you when they decided to do something. Just had ANOTHER round ruined. Played 3 rounds just fine. Suddenly a guy shows up and its Frontlines and this guy is going like 26-1 in the first 5 minutes... next highest score in game was like 5-4 lol. Hmmmmm. It seems you played with or against (can't know since BFTracker doesn't work properly) two of my platoon mates, and they were the only ones that posted such figures. Twice they were in tanks, in which they are beastly. Two other occasions as assault. Nothing special, nothing out of the ordinary. Such things occur quite easily when there exists large skill discrepancies on a server, and fortune favours the opportune. I can assure you they were not cheating. I don't want to be "that guy".. But 26-1 is entirely possible even within the first 5 minutes. Particularly when medics are doing their job by reviving and thus removing any additional deaths the player in question is likely to have had. This is true. The hackusation culture is thriving because nobody is confident that DICE or 3rd parties are dealing with cheats effectively. I feel that the only way it will get better is with a more aggressive anti-cheat platform (users see bans live and in real-time). That, or custom servers are allowed where users can moderate independently. Could you please tell me your opinion about this one? His name is "[name and shame]", we've met him like 15-20 minutes ago (I've reported him already, but I'm still curious about your thoughts). Well for one you're not supposed to put his name in the video or name the "cheater"
Could you please tell me your opinion about this one? His name is "Badcampernoob", we've met him like 15-20 minutes ago (I've reported him already, but I'm still curious about your thoughts). Then we can check the stats of the round on battlefieldtracker.com to see how many revives he received that round. So many times, those 21-0 guys got 0 revives. I'll just say this, for me to go out of my way to come onto a forum to talk about it. Something is wrong. I'm usually the person defending people being like naw they aren't hacking just good. But there is something seriously wrong with the system in this game. And its not unreasonable to think either considering they rushed everything else in this game. There are many loop holes. A 5 second Google search alone finds so many hacks is just SAD. I usually don't bother with hackusations. I've played every BF. And recently, BF1, I recall maybe 5 times in the entire 2 years or so that I noticed batant hacking. 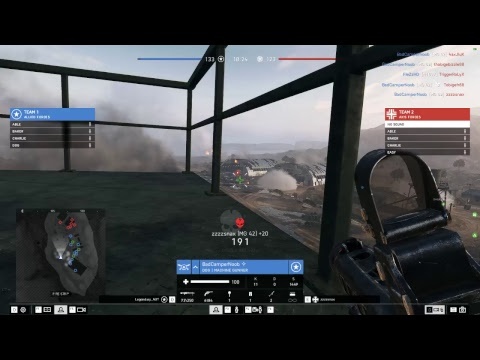 In BFV I've noticed it every other round. In every game mode. Something is up. Getting kind of creepy when the closet cheaters come here to whine about the blatant cheaters. Who or what are you even talking about. He's talking about me, most likely. It's best just to ignore buddy and move on. Leave the man to his conspiracies about ea/dice and hackusations about myself, other players, and content creators. Yep that is likely, but I'm willing to put down money that he's also seen Tyrone's 200+ kill rampage and lost any semblance of critical thought. I hope he hasn't checked how I've recently been doing back at BF1. It'll be even funnier when the banhammer gets dropped on them in game when the anticheat gets another notch increase and they have to cut their live feeds quick while pleading innocence. "I'm not cheating.. I have been recording my hand for the entire match. (Not the active esp and mild aimbot on screen! Oh they'll never know. I'm just a "better player".) Massive banwave due soon. ;-) Hopefully it'll weed out alot of the closet smart behinds. Game needs a major clean up. Game is on the shelf until then. Appalling show of ac support so far but Dice are on it. I played a game with Ravic, and either: a) Someone spoofed his name. b) He was cheating. c) It was like the MattiAce video where the guy following him was 3D spotting everyone. We were on Hamada and I was on G while Ravic was flying around. I was all by myself in an area where I couldn't be spotted and we had the surrounding flags. He was actively dogfighting, and a handful of times when I got in the AA gun on G, (didn't fire a shot) he would almost instantly snipe me with Minengeschoss rounds from a distance where the AA gun would have barely rendered for him (certainly out of the airburst's range). Now on the subject of anti-cheat, there were people cheating in the beta, as well as the early access launch. I read some forums (what little I could without being a subscriber) and people were getting 1 week suspensions during the early launch. Aim Junkies is probably the worst site and a waste of money it seems. I watched some videos of Aim Junkies, and their hacks are pretty much walls, aim snap, triggerbot, the works. Almost all AI and no human element. Idiots bought a subscription and tried to quick scope like CoD and were getting banned left and right. Then the forum mods were beyond useless, insulting them, telling them it's their fault they got banned. I mean sure, if someone runs the script and that alone isn't bannable, I guess it's undetected, but to get banned when you actually start using it, what's the point? Other sites have more human-like features that are basically just improved aim assists, and some don't allow all headshots and force bone switching to avoid being obvious. I was in this same match with you. I joined it way late though. There was someone on our team using a spotting cheat. It was spotting 100% of the enemy team. I looked for the person on our team with a high score, and low kill count. And pointed out in chat, that they are a possible suspect for the spotting cheat. That person did what all good cheaters do, and LOL'd me. But, for some reason the spotting cheat spotted happening after that. And this "ravic" character went something like 83-2 on the next map. Others were reporting seeing teleporting happening. But, I didn't observe that. There were a few times in that match where I would hop in the gun and hop out or fire a few shots and hop out. Then I'd watch Minengeschoss rounds hit that gun like a bullseye and he'd still be way outside of the airburst's range. So I was half right. He wasn't using a program, but he was taking advantage of the guy on his team with the hack. Like the guy from MattiAce's game, but he said he felt bad and just stuck to dogfighting. This is a late reply. But, I'm clarify my statement for the record. As I was contacted by direct message from a forum user named Ravic, who said my post could be misinterpreted. I had no evidence nor even suspicion of the player with Ravic in the name. The only reason I mentioned that was to show that I was in the same match, and that person had a very high k/d. Its been too long now for me to even remember if that user had the correct spelling or any changed characters in the name. It is entirely possible the player name was something other than the exact spelling of "Ravic". The entire point of my post was to show that someone on my team was using a spotting cheat. The person I suspected of doing that was *not* the player with Ravic (or some variant of that) in their name. It was some other player who had a very high score and almost no kills or deaths. Honestly in the ~400 rounds i played so far, I encountered maybe 4-5 cheaters, where I can definitely say, these guys were hacking. On the other hand I got called a cheater already a couple of times, and I usually don't respond to these (obviously i'm not, sometimes i get good rounds, but i'm only above average). When it comes to hacking, it's usually guys who round around with LMG and casually headshot people on 200-300m distances. So far i don't think cheaters are much of a problem in this game, but maybe i've just been lucky. Yeah, you're very fortunate. I went on to play this morning, the only grand ops server on - had two rage in it. One guy with a 4.80KPM and 46KD. The other guy looked like he had more sensible stats, but he was cheating too and admitted so in chat. saying that he does it for the trolling and rage from players and he told the 46KD guy to add him. I didn't even spawn in. I left to spectate. I don't know how dice or just any anticheat can't see hey, ~5KPM for infantry is not very likely, lets flag this guy and watch him (and record it) then ban him. Not even former pros are getting 5KPMs. Most really good players are getting over 2.2KPM and if they are super good like relaaa, 3KPM. not much higher than that. No 4. No 5. No 6 infantry kpm. The AC should know this. Honestly in the ~400 rounds i played so far, I encountered maybe 4-5 cheaters, where I can definitely say, these guys were hacking.....So far i don't think cheaters are much of a problem in this game, but maybe i've just been lucky. Most cheaters run subtle ESP hacks that you'll never be able to confirm. There are lots of smart cheaters out there that cycle cheats on and off to pad their scores, yet are smart enough to realize that posting ridiculous K/D and KPM ratios while on foot will raise suspicion. Kids think anything is trolling nowadays. They do literally anything and just slap the word trolling somewhere on it. Dynamite to a sniper, melee kill, eating, breathing, you name it. Just saw that post of someone saying he got banned. @DigitalHype that guy you kept telling to wrote ea support had over a 70% headshot to kill ratio with his sniper weapons for someone who has poor aim.